Evolution, Automating Lawn Mowing | OhGizmo! Well, you have the Roomba. And now, you have the Scooba. 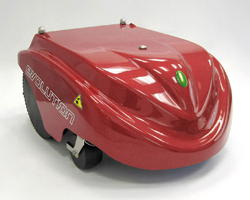 But once you have had your floors cleaned by a robot… will you actually have to go out and mow your lawn yourself? Well, not if you have 2500$ to throw around. The newest in a line of such bots from company Robots and Relax, the Evolution is billed as the “newest, most advanced robotic lawn mower available on the market”. Looking at the specs, I almost want to believe it. See, it has this set-it-and-forget-it kind of functionality, which I find great. It comes with sensors that detect long grass. If it finds a patch of long grass, it’ll take care of it. Once its done, it’ll just sort of go around, hunting for more long grass. It can handle an area up to 33 000 sq.ft. and has lithium batteries. Don’t know how long they last, but still, you have to admit this is pretty cool. Visit the website. Story VIA CoolHunting.com. I’ve had the “Robomow” from Friendly Robotics for the past 4 summers. This unit is by far, the best bang for the buck, it’s a fraction of the cost listed for the other units. Other than replacing the batteries every two years and the blades each year, it just works. Very cool, a lot like those little automatic robot vaccumes, but with razor sharp blades instead of a harmless vaccume. I completely agree with jberger that the Friendly Robotics robotic lawn mover is AWESOME. My husband is so excited about mowing the lawn with his robot pal it’s just ridiculous. And it does a decent job to boot. The price has gone up a bit since we bought ours 3-4 years ago. I think we paid about $800. Ummm… I don’t know. Something always malfunctions and though I wouldn’t have a problem with a malfunctioning vacuum robot I don’t think I’d want to deal with a little malfunctioning robot of death. But still cool. I really like it. Kids will probably try to ride on it or something. I think someone might steal it. So I think it should have sharp metal spikes covering the top of it to make it safer? But seriously I can see someone getting sued becuase they weren’t watching the kids. That something new…. never see before.